Some have been waiting for this moment for as long as last March - the moment when the slopes are again covered in snow and they can grab their skis or snowboard and head downhill fast. Over the past few years Bulgaria has become the dream destination for many of these people, with its winter resorts attracting investors, fans and benefactors from all over the world. Although the country is small and its mountain resorts only a handful, it has somehow managed to finally turn skiing into its calling card thanks to several crucial factors. One of the most important is the resorts themselves - each distinctive with their own charm, size, and the type of tourists they attract. Most avid skiers in Bulgaria already have their preferred resorts, but for those, who still haven't had the chance to get acquainted the choice may be tough. There is the old-time favorite of Borovets - the glitzy resort that in now loosing ground to Banko with its rush of UK property buyers. Pamporovo's appeal should not be underestimated, either, and Vitosha's greatest advantage is that is just a stone throw away from Sofia's downtown. Borovets used to be a high-class resort where only those of means could swish down the slopes, and many Bulgarians still see it as the paradigm of winter glitz. It offers extra thrills for the experienced skiers urging them to savor the magic hour when the dazzling floodlights begin to take over the dwindling daylight, and night skiing begins. With four runs open at night at the height of the season with illumination and sound, Borovets is the best place for night-time skiing in Bulgaria, its runs open until 9 in the evening on a daily basis. Despite Borovets' appeal, however, Bansko has lately become the biggest star among Bulgaria's resort, especially for foreign tourists. With property prices in the area skyrocketing as more and more Brits see this as the best place for a retirement home, Bansko has seen a great influx of cash this past year. To add to its star-studded image, Austrian ski legend Marc Ghirardelli, who owns stakes in the resort, has been boasting its advantages all over the world since the summer. Bansko's runs may be easier and less in numbers than those in Borovets, but the place charms with its atmosphere and traditional Bulgarian revival-style houses, pubs and people. Pamporovo is smaller and its charm lies in the fact that it is located in the middle of a forest in the Rhodope mountains. Many tourists prefer the relative seclusion of this resort and the fact that most hotels are huddled right among the trees. When it comes to Vitosha, the resort has one (and only) main advantage - location, location, location. With Sofia lying in its very foot, Vitosha is the perfect getaway island for the busy skiers. Even those just in for a quick business trip can pack their skiwear and steal an hour or two to clear their head while flying down the slope. 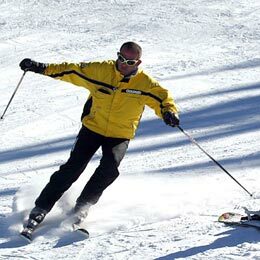 Bulgaria's increasing ski appeal comes mainly from the fact that prices, compared to those in hotspots like the Alps, are lower. Although the increase of foreign tourists has led many wide-eyed merchants to upping their prices, a ski trip in the country is still relatively cheap, but only to the guests from other countries. More and more Bulgarians see that fares are too high for their average living standard and go for the smaller, less popular and less developed resorts. But when it comes to ski equipment and clothes, for example, most guests in Bulgaria are ecstatic, for they find their gear is much cheaper when purchased in the country. World media have done a lot to popularize Bulgaria as a "dream destination" in the past years, especially in the UK, where most pensioners now see it as the perfect retirement home, and many families chose the cheap offers for a week or two at the seaside or in the mountains as their chance to have a vacation abroad without coughing up a fortune. With the establishment of a State Tourism Agency, Bulgaria started advertising its tourism hotspots much more and the times when most Europeans could only name Sofia and Stoitchkov when asked what they knew of Bulgaria are long gone. Seeing how the buzz around the country is rising, media try to cater to the demand and often hatch prolonged articles on how Bulgaria's resorts rate when compared to other skiing pearls. To be quite honest, there is still too much to be desired from the local resorts - tracks need to be more and better, for a wider scope of athletes, municipalities have to fix sewage and electricity systems that are struggling at the great influx of tourists and the roads leading to the mountains simply have to be repaired. But there is a certain charm to it all, a feeling of the real mountains, with their roughness and beauty and a sense of belonging in that only Bulgaria's hospitality can provide. And that's the biggest asset that the country has to offer - the one that has been attracting tourists by the scores.